1 An anniversary is a time to celebrate the joys of today, the memories of yesterday, and the hopes of tomorrow. Happy Ruby Wedding! 2 The secret of a successful marriage will remain a secret - or did you find it after 40 years? 3 Marriage means commitment. Of course, so does insanity. Happy 40th anniversary! 4 Happy Ruby Wedding!. You managed your life together for 40 years and you have had bad and good times but always stuck together. I wish you all the best for the rest of your life. 5 After 40 successful years I can say: You are like salt and a paper cut, two things that aren�t supposed to be together but end up that way anyways! 6 We wish you all the best for your Ruby Wedding anniversary. May all your wishes and dreams come true in the next couple of years. 7 It is so nice to find this special person you want to annoy for the rest of your life. I wish you all the love for your ruby wedding anniversary. 8 For your Ruby Wedding anniversary we are sending 40 cuddles and 40 kisses and all the best wishes we can find. 9 If you could go back in time and wouldn�t change marrying your partner for anything in the world, then you know, that you've done the right thing 40 years ago! 10 All the best wishes for your ruby marriage anniversary. We hope you will have another 40 years in harmony. 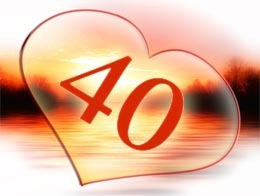 11 For you 40th Wedding i wish you a great anniversary party with all your family members and that you are able to spend the rest of your life in such harmony. Please vote for your favourite ruby wedding anniversary wish in order to support our toplist of good congratulations.